This is our “Versatile” storage bag, so called because it can be used for so many things. We’ve designed it with 600D heavy duty polyester material, like our other heavy duty bags, and to make sure that it can handle lots of weight, the handle is stitched to a special band that goes all the way around the bag, unlike other bags which just stitch to the bag. This stops the handles pulling out and allows the bag to carry really heavy weights (this is the best and strongest way to create handles). The zip doesn’t just go over the top either; it extends down the sides partway so that you can open it up wide and fill the bag more easily. 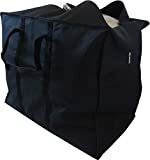 As such, this bag is perfect for storing clothes or bedding away at home, but can also be used to pack full of clothes and spare duvets when throwing stuff in the car, and thansk to its heavy duty material, it will stand up to a fair amount of wear and tear, as well as allow you to put other items you’re needing to take away too, be that books or other heavy items.